Embarrassing Confessions of the Financial Kind. The view from a bridge over the river Cam. Yesterday Luke and I caught the bus into Cambridge (we’re in a little suburb that’s out along a freeway) and our first stop was a camping store to find an OS map. Now, even though Luke assures me that there is barely a handful of people in this world who are as interested in maps as I am, I’m going to explain that an OS map is an Ordnance Survey map. They were created by the army to help defend England in the 18th century by accurately mapping the south of England. 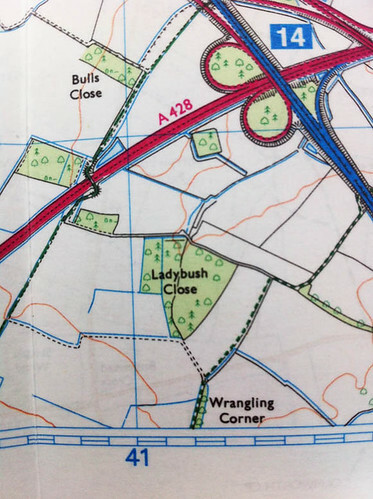 And when the army said they were going to ‘accurately map’ they didn’t muck around. OS maps are incredible. They have *everything*. They show every dirt track that is open to the public, small groups of trees (and differentiate between coniferous and non coniferous) and buildings, four kinds of rocky ground, about 30 types or buildings… it’s amazing and incredibly useful. One of the things I like most about England is that there are public footpaths pretty much everywhere. In Australia you just wouldn’t think to walk across fields (usually because there’s barbed wire to negotiate, deadly animals, it’d take all day and there’s cars for goodness sake) but here it’s only a kilometre or two to the next village and the most direct route is through a farm, between two fields, past the pond and up a lane. It helps that it’s just so darn pretty too. England is made for walking. Later in our visit I’m hoping to tick something off my bucket list by walking across England via Hadrian’s Wall, 80 miles of scenic countryside where Scotland and England meet. We’re going to cheat slightly and use a porter company that takes our bags from hotel to hotel while we do the walking in between. Pretty much my ideal way to get around. But back to yesterday. 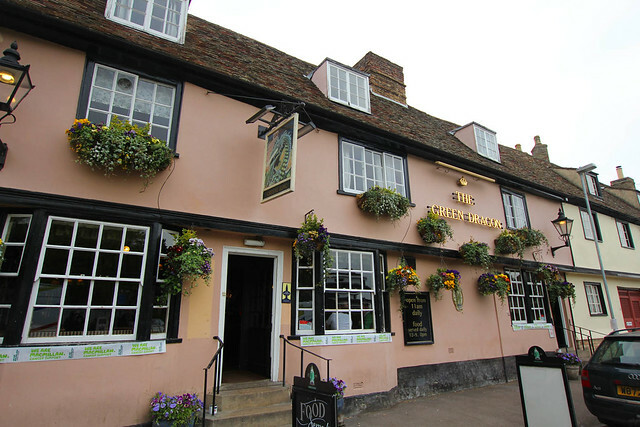 We bought two OS maps, one for Cambridge and the other for Bar Hill and decided, since it was starting to rain, to head along the river to the Green Dragon a couple of kilometres away. The Green Dragon is a wattle and daub building that has been a hotel since medieval times. When I first moved to Cambridge Andrew and I lived just around the corner from it. They used to do the most epic Sunday roasts you could possibly imagine but the menu is a lot more generic these days and their lawn down to the river was being dug up by a gas company. A shame, but it was a nice walk anyhow and lunch was cheap. We walked back into town and did some shopping before catching the bus back to Bar Hill. I’d promised to make chilli for dinner so we bought ingredients and also a phone card to finally solve our bank issues. Feel free to skip the next bit unless you’re fascinated by tales of ineptitude. Anyone who knows what I’m like with money will not be in the least surprised. Cash: we’d spend from a shared pool of money. This has worked pretty well since we’re eating, traveling and staying together all the time. Much, much easier than splitting every single meal and hotel etc. I took out $1000 AUD each in baht, euros, pounds and US dollars before we left and Luke paid me for half or it. Then when we need to top up we get out cash in turns. Cards: I have three cards – one 28 Degrees credit card that has no international fees and no interest if paid off within the month, and my regular NAB credit and debit cards. Luke has a 28 Degrees credit card, another credit card and a travel card. I’d record all our spending in my diary. So far we’ve written down nearly every cent we’ve spent but I haven’t yet tallied it all up yet. Our first 9 days in Thailand came to $120 a day each and we stayed in a 5 star resort for most of it, so not a bad effort. Budgeting: we are aiming for an average of $100 (not including flights) a day. Our only issue so far has been with our cards. It takes 3 days for any money moved to Luke’s travel card to show up so we’ve had to plan ahead and keep an eye on when it’s getting low. The travel card has been our main source of extra cash because (to no one’s surprise, particularly my own) I’ve lost my debit card somewhere along the way and don’t have the pin numbers for my other two credit cards (yes. I know). To explain (sort of), I pretty much exclusively use my debit card or cash when I’m at home and only use my credit card online and, somehow, the need for a pin didn’t occur to me until we left. Luke (much more surprisingly since he is actually good with money and keeping track of stuff like that) also didn’t have the pin for his credit card. On top of all this we had the added problem of sms id on my accounts, which means I can’t transfer large amounts of money without a code that is sent to my Australian phone number, and Luke’s bank changing their operations in a manner that was difficult to resolve from overseas and caused him to be unable to access one of his accounts. So, between our stupidity and banks changing their rules we’ve been mildly inconvenienced and we couldn’t sort it out until we got to the UK because we were either out of phone range or didn’t know where to get international calling cards. Luke has an international sim in his phone but the rates are extortionate and there was no way we wanted to be several dollars a minute to be kept on hold for god knows how long. To cut an extremely long and boring story slightly shorter, we bought a phone card that is a few pence a minute to Australia and we called our banks and sorted everything out. At no point have we been without money, and we have been able to use our cards to buy tickets and pay for hotels and meals so it’s been ok, I just prefer to have as many options as possible when it comes to paying for things. I suppose the lesson in all this is that it’s good to have multiple cards and multiple accounts just in case and it’s good to travel with someone who makes up for what you lack. « Cambridge: a short update. You know you can load money (as long as its not too much….say $500) onto the 28 degrees card and take that out (and as long as your balance is positive/you don’t have debt or whatever it won’t cost you anything)? ie no ATM fees or currency conversion? I couldn’t withdraw the money without a pin though, could I? Yeah you’d need a pin I’m guessing, is it that card that Luke forgot his pin for? And don’t worry, I’ve “lost” bank cards when o/s too….only to find them a year later at the bottom of a bag. Are you sure you can use the 28 Degrees Card like a debit card? Like using it at an ATM to withdraw cash? I thought that was technically a cash advance, which costs you money? If you can, and it doesn’t cost you money, that’s a neat feature. We have the NAB travel card which we’re going to make sure is topped up with money, so we should always have a debit card with cash on it to withdraw, and a credit card for when it’s useful to use that instead. So we should never need to top up our credit card in the way you describe, but it’s something to keep in mind as an option. It’s weird, I don’t even remember seeing a letter with the PIN number for my 28 Degrees card. Either I never got the letter, or I’ve forgotten that I ever received it. Yep, I confirmed with them, and with a friend who has used it that way. It’s only a cash advance if you’re using the credit (I’m rubbish at describing it…) ie if you actually load it up (not with TOO much or they get suss or something) then you can use it as a debit card until you’re back to zero. Does the NAB travel card not charge you x% every time you load up (they tend to) and a small fee for taking cash out? It charges you 1% of AU$ equivalent reload amount (GST inclusive) every time you load up. No fee for taking cash out, as long as you’re withdrawing a currency that you have on the card (e.g. GBP, USD, THB, etc). If you’re trying to take out USD and you only have GBP, they charge a 4% fee on the total amount withdrawn. Yeah, 1% isn’t much but that still annoyed me with travel cards. And the single currency thing. That’s why I jumped at getting this 28 degrees card when I heard about it. I’ve been thinking about this exact thing for a while, and how screwed I’d be if I lost my phone, so I called up my bank a while back to enquire about the possibility of getting the sms verification tokens turned off, and with at least bankwest it’s apparently possible. I need to call up tomorrow and make it actually happen (their system couldnt set it to stop being required at a future date and they didn’t want to turn it off weeks in advance). Yeah, we’ve both had to call and have our SMS authentication switched off. With NAB that limits daily funds transfers to $2500, but that’s usually more than enough for our needs. That said, there are times where we could have called through Skype and it would have been a lot cheaper. Lesson learned! Now we both have UK SIMs, so it’s not really an issue, but when we leave the country I think we’ll turn to Skype for calls before my old travel SIM and its ridiculous rates. Since my last few trips overseas have been to Japan, I’ve pretty much gotten used to just carrying ridiculous amounts of cash around with me when I travel. In any other country in the world you’d probably be insane for doing so, but in Japan at least the odds of you being mugged or robbed are comparatively very low. Aside from that however, it’s just impossible to get by any other way, for some unfathomable reason Japan doesnt use EFTPOS, most stores dont even accept credit cards, and the ones that do mostly don’t accept foreign cards anyway. To make matters even more inconvenient, most ATMs don’t accept foreign cards either, so you’re always on the lookout for a 7-11 where they do. Wow. Be more inconvenient, Japan! I took my credit & debit cards with me. For some strange reason my credit card required a PIN to use in Chile & Peru. It doesn’t have a PIN – I’ve always kept it as a signature-only card. I ended up having to use my debit card as a credit card (to make international transactions – it’s set up that way) as well as to take cash out. Weirdly, although my debit card DOES have a PIN, which I needed when using an ATM, when I used it as a credit card it didn’t request the PIN! I need to call my banks and work out what the hell was going on, because if I’d really needed the credit card I would have been screwed. Lucky for me my living costs were about 60 soles per day, which is less than $25 AU, so I had more than enough in my debit account. I actually saved money while I was away. I’m enjoying reading up on your adventures!